Every issue of New Electronics provides electronics design engineers with practical information in an exciting and compelling format. A highly experienced team of journalists includes qualified engineers with exceptional expertise and a passion for their subject. The information below is by no means an exhaustive list of editorial coverage, but it gives a good cross section of the high value content readers receive in every issue of New Electronics. You are welcome to contact me with your press releases and content ideas. Comment – the editor's overview of a particular innovation or recent development across the industry. News and analysis – giving the story and outlining its significance to electronic design engineers. Expanded cover stories – these three page features have broad appeal across our readership. Technology features – these two page features run throughout the magazine and every issue covers key issues and innovations within research & development, embedded design, communications design and system design. Interviews – comprise a two page interview with a senior industry figure. Company profiles – provide an insight into a market-leading engineering or supplier company. Special supplements – As well as a breadth of information across electronic engineering design, our readers need a deeper insight into specific areas or particular industry issues. To meet this need, New Electronics runs supplements and extended special reports throughout the year. New Electronics is a fortnightly magazine focusing on technological innovation, news and the latest developments in the electronics sector. 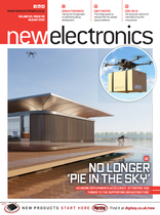 Downloadable as a digital page turner or pdf file, or offered as a hard copy, the New Electronics magazine is available in a format to suit you.